Heat transfer is the movement of thermal energy through conduction, convection, and radiation. It is a basic yet very important physical phenomenon. Material properties and other physical phenomena are very sensitive to temperature (or thermal energy). 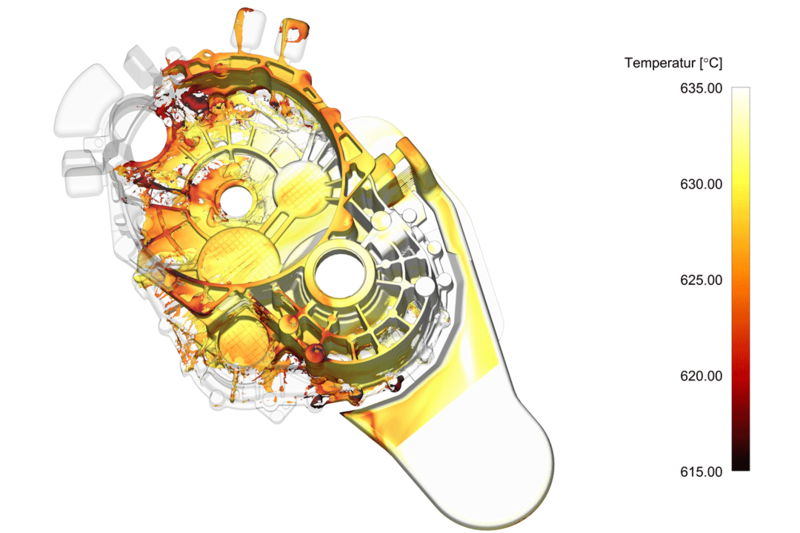 For numerical modeling tools to be able to correctly capture the physics and detailed behavior of a system or process, they have to be able to model the heat transfer correctly and accurately. The heat transfer model in FLOW-3D and FLOW-3D CAST solves full conjugate heat transfer equations, accounting for heat transfer within and between fluid, solid and void through conduction, convection and basic radiation. Both explicit and implicit heat transfer options are available. An implicit method can be used to remove the time-step size stability limit associated with an explicit approach. When the conductive or heat transfer stability limit is substantially smaller than other stability limits in a simulation, using the implicit method can significantly improve the efficiency of the calculation. Heat transfer coefficients between different media can be either user-defined or calculated automatically based on the type of the flow. Both first- and second-order thermal energy advection algorithms are available. The first-order option is efficient, robust and is suitable for most heat transfer problems, but can lead to artificial (numerical) diffusion of heat for simulations where high thermal gradients are expected. The second-order option is appropriate in situations where resolving temperature gradients is of primary importance, for example, in buoyancy-driven flows. Several options are available to model heat transfer between fluid and solids – from specified heat flux to power source to prescribed temperature. These options provide flexibility and power for modeling different processes and applications. Coupled with other physics models, the heat transfer model in FLOW-3D and FLOW-3D CAST serves as a solid foundation for advanced modeling capabilities. For example, liquid/solid and liquid/vapor phase change models can be used to simulate metal solidification, drying and boiling of water, and spray cooling. Viscous heating can also be included in high-speed viscous flows.